In buying a baby toothbrush, first be sure to look for the age recommendation on the package of a particular brush. 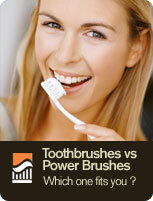 For example, choose a brush specifically designed and labeled for babies if your child is less than two years old. A long, thin-handled brush that fits your hand and helps you reach teeth is best for your baby's first toothbrush. The small head of the brush should contain soft, rounded bristles. Once your child reaches an age to brush him or herself with your supervision (around 6 years), choose a brush with a chunky, short handle and finger grips. For ages 3 months and older, you may want to try teeth wipes. Pediatricians and dentists suggest wiping your baby's teeth and gums clean daily to help prevent a condition known as baby bottle tooth decay. Because sugars in juice, formula and foods can cause build-up of harmful plaque-like film and bacteria that leads to premature decay and gum disease, dentists recommend wiping your baby's teeth and gums after feedings, particularly at bedtime.